For the first time since starting our blog Matthew and I are going to write a joint post, and the reason is simple. I, Megha, have created the most Delicious Low Carb Mug Cake and it is important that I receive credit where it’s due. Matthew, on the other hand, has created a Nutritious Low Carb Mug Cake for which I want no credit whatsoever! We are each going to write half the blog describing our creations and why you should make ours. The ultimate decision, however, will be in your hands, and after you’ve made both you can determine who the true winner is. Let the games begin! It goes without saying that as humans we seek out the delicious. Delicious foods, delicious books, delicious relationships. The word ‘delicious’ describes anything ‘highly pleasing to the senses’ and my mug cake does just that! Let me tell you how this will all play out. As you open the microwave you’ll be hit with the sweet smell of sugar. Next, as you place your fork into the mug cake you will excitedly notice how moist it is. You’ll take your first steaming bite and just as imagined, you’ll relish in the dense texture as you’re reminded of your favorite pound cake. And then, all at once, it will hit you that it’s also low carb, and you’ll think to yourself ‘It’s a masterpiece!’ as you dive in for another bite. The secret ingredient in the delicious mug cake is sour cream. Yes, you read that correctly. In case you’re skeptical let me give you a few examples of which sour cream plays a staring role: cheesecake, coffee cakes, a variety of cupcakes and tart pies! Are you convinced? Flavors and textures aside, the macros are also great on this mug cake. 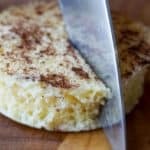 Just as any keto dessert should be – high in fat and low in carbs. Megha left the blog unattended, and it couldn’t have been at a more perfect time for me to weigh in with my mug cake. If you’re looking for a something to hit your sweet tooth without being too indulgent then this Nutritious Mug Cake is exactly what you want.” It’s definitely NOT the finest tasting dessert in all the land, but it’s a dessert that I’ve been making for years now, and there’s a good reason for that! It tastes good! Not great…but good. The macros, however, are the most incredible you’re likely to find in a dessert. We’re talking less than 1g of carb here! Aside from the amazing macros another benefit is the simplicity. Got a coffee mug and a few basic ingredients? Then you can whip this low carb mug cake up in about 2 minutes. Over the years we’ve tried so many different variations on mug cakes and these are our 2 favorite low carb mug cakes! We opt to purchase Isopure which is a zero carb protein powder, hence, the incredible macros in this mug cake. The protein powder is also sweetened so you don’t need to add any extra sweetener like you do in the ‘Delicious Mug Cake’. Any protein powder will work as long as it’s low carb and high taste! The nutritious mug cake may not look as beautiful as the other one, but looks aren’t everything! It’s whats on the inside that matters, am I right? The most important thing is that the nutritious mug cake holds truer to keto in macros form. Don’t let it’s monstrous appearance deter you! Now, we’ve given you upsides of both mug cakes and exactly how to make them. So, it’s your turn to go into your kitchen and taste test them for us.. how else will we determine a winner?! Let us know which of these low carb mug cakes you prefer! Combine almond flour, baking powder, salt, erythritol, vanilla and melted butter well. Add sour cream and combine well. Pour into mug or ramekin and microwave for 90 seconds. Keep an eye on it for when it rises too high. Tip: If it rises high (over the rim) open the microwave door, let it deflate before finishing out the 90 seconds. Combine protein powder, baking powder, egg, melted butter and almond milk in a coffee mug. Mix thoroughly removing as many lumps as possible with a fork. Microwave for 1 minute. Let cool for 1-2 minutes. Enjoy!